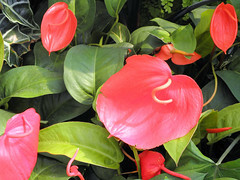 Scherzerianum (or Pig-Tail Anthurium) are a beautiful breed of anthurium plant that produces red, orange or pink flowers. What sets them apart from Andraeanum is their spadix. They have a curly spadix, rather than a straight one like Andraeanum. Since they are closely related to Andraeanum, Anthurium Scherzerianum Plant Care is really not very different than what is required for Andraeanum. I suppose that the main difference between the species is that Scherzerianum is a bit better adapted as a houseplant so they are in fact a little easier to care for. The ideal temperature for it is 80 degrees. Ideally, it should not be exposed to temperatures below 60 degrees or above 90 degrees. Temperatures below 60 degrees will hinder growth and flowering, while temperatures above 90 degrees can cause damage to flowers and leaves. Freezing temperatures are to be avoided at all costs, since exposure to frost can be deadly. Bright, indirect sunlight is best. But direct exposure to midday sun can burn leaves and foliage, so make sure that it is never exposed to strong, direct sunlight. If your plant is near a window with direct sun, cover the window with a thin, filmy curtain to block a portion of the light. If your plant receives too little light, it may stop flowering. A tell-tale sign of insufficient light is a plant that produces a lot of dark green leaves and no flowers. Any loose, well drained soil will work well. If you have access to volcanic cinder, you can use it. If not, you can use a mix that has bark, moss and perlite. The key is to make sure that your potting soil drains well. Excessive moisture can cause root rot and other problems that may harm your plant. Water your plant regularly, but make sure that the water drains out of the pot quickly. In the rainforest, these plants grow up the side of trees. Despite receiving daily water from rain, their roots are never soaked in water because the water drips down the side of the tree and away from their roots. Since your plant is in a pot, you need to make sure that all of the water drains out of the pot and the potting soil dries slightly, but not completely, before watering again. Humidity should be high, but not excessive. Somewhere around 70 to 80% is ideal. Any higher and fungal issues may occur. Down to 50% is generally fine. But you may want to mist the leaves once and a while. Mist the leaves in the morning and make sure that they dry by the evening to prevent fungal problems. If they don’t dry by the evening, this means that your humidity is more than enough and you don’t need to mist your plants. At this level of humidity good air circulation is essential to prevent the growth of fungus.